Science Fiction | Elaine Reads . . . constantly! When a former hacker and activist who knows a thing or two about infiltrating networks starts investigating the cause of this disaster, he soon becomes a prime suspect. As threats to the United States start to emerge, he goes on the run with a young American reporter based in Paris, racing desperately to turn the lights back on. Because if they stay off, tomorrow may be too late. Although I rated this book as a three, it is really a 3-4. My main criticism is the multiple points of view. I finally got them mostly straight, but I had no idea who was who in the first few chapters. I’m not even sure if some of the characters were necessary to the plot. I’m still not sure that I didn’t mix characters up, but it didn’t matter in the end. I had a hard time getting into the book. I thought it was slow to develop, but since it was for review I stuck with it. I’m glad I did. It turned out to be a really fascinating story and the societal breakdown due to an international power outage was not something I had ever considered. I do have a hard time believing that things got as bad as they did in only a couple of weeks of no electricity. Maybe because I live in an area where power outages happen on a regular basis. Nothing like what happens in the book because I can always go somewhere that power is available, but still. I kept thinking that these people were so unprepared. Apparently, no one had more than a day or so of food in the house. Now, after sounding so smug, one thing I had not thought about was the need for cash. It doesn’t matter how much money you have in the bank if you can’t access it. I don’t ever keep more than a few dollars on me because I just use plastic. Well, if there is no power, that will not work. And that’s why this book is almost a four. It made me think. We all know that we should be prepared for emergencies, but I am guilty of just knowing I should and not actually doing anything about it. This book has made me think about how dependent I am on the infrastructure and how I need to better protect myself. So yes, I definitely recommend this book. After the slow start, I couldn’t put it down. I had to know what was going to happen next and who the bad guys were. There was a twist at the end that I did not see coming and it made the book even better. This is definitely a great book if you enjoy suspense and to a certain extent apocalyptic themes. This book was sent to me by NetGalley in return for an honest review. I have no idea how I first found out about the St. Mary’s Chronicles series, but has become one of my favorite series. As in, I stop whatever I’m reading when the new book comes out just so I can read about Max. I always think I like/love them because they are funny and they are . . . hysterically funny at times, but the can also be heartbreaking. I feel like the characters are members of my family and I hate some of the things that happen. Regardless, they are still funny and those are the quotes I am going to share today. First off, Max is trying to get back in shape after a long time in convalescence. She is running around the park at St. Mary’s. I completed one circuit, chugged back some water and, encouraged to find I was still alive, decided to give it another go. Actually, that sounds a lot like me, although I wouldn’t have survived even one circuit. One of the male characters is talking to Max and I can’t tell you which one due to spoilers. This last one is not a funny, but I have had this feeling myself. I am always astounded when people don’t know about Schrödinger’s Cat. It’s not that I understand quantum physics. I don’t! I do know about the theoretical experiment involving the cat. After all, it is referenced in literature over and over again. At least in the literature I read. And that’s it. Like always, don’t read these books out of order. You will not understand, much less appreciate them if you try to do so. 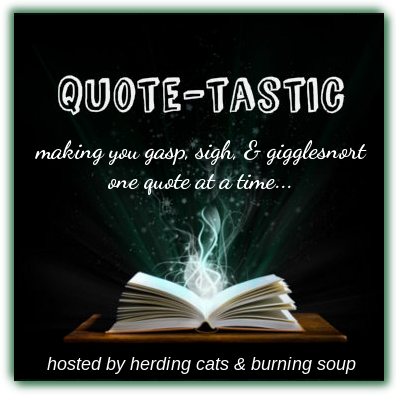 “Quote-Tastic Monday” is a meme hosted every Monday on Herding Cats & Burning Soup. Head on over there to see what everyone else is posting about this week. This is my first Julie Kagawa book, but it won’t be my last. I have gotten tired of the entire Young Adult vampire genre and delayed reading this book for years. I thought to myself, been there, done that. Kagawa brings an entirely different plot to the many, many vampire books that have saturated the market. Is there a romance? Yes, but barely and it certainly isn’t the focus of the book. Are there vampires? Yes, of course, but although she has kept many of the standard vampire themes, the world itself is completely different. No, I’m not going to tell you how. Spoilers are not your friend. You really will have to read it for yourself. I will share one passage that I got a kick out of. It’s almost a throwaway part, but because I know the traditional vampire tropes, it struck me as funny. And no, she can’t turn into a bat and fly away . . . at least not in this book. 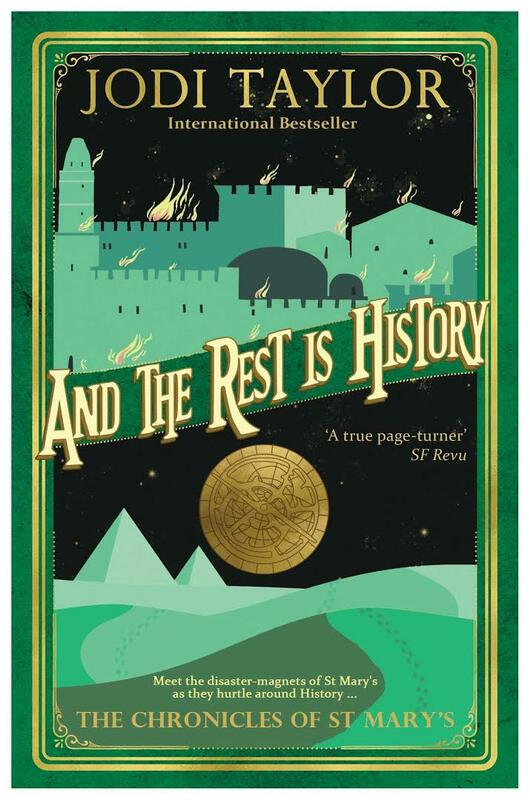 I am a high school librarian and I really only read this book so I could discuss it with my students. I never intended to read the sequels. Well, I am now. I have to know what happens to Zeke, Ally, and the rest of the characters. Some of them I want to be sure survive and others I want to make sure DIE! I am so glad the next two books are already published. I would hate to have to wait to find out. 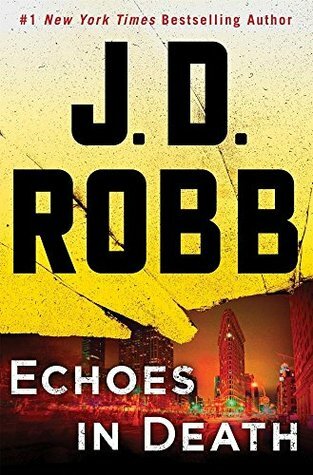 I don’t read a lot of Nora Roberts, but I love her J. D. Robb “in Death” series. I have all of the books and there are over forty of them. They’re futuristic, murder mysteries, and some of the best romance I have read. Roarke is to die for . . . pun intended . . . and Eve is one of the strongest, most human, female characters I know. Anyway, the books are just good. That sounds like faint praise, but really, it’s not. There’s a reason they’re still going on after forty books and it’s because they’re so good. Because these are murder mysteries, they are intense. The dialogue can definitely give the reader a chance to breathe because it lightens things up. In this excerpt, Roarke is telling Eve about the first wife of one of the victims. This woman had moved to Australia after the divorce. “Blame the Aussies. In any case,” he continued before she could take him further into the weeds, . . . I love Eve’s literal take on things. Later on, Roarke is trying to get Eve to take a break and she refuses. “I’m not drinking milk. Do you know where it comes from?” The idea made her shudder. 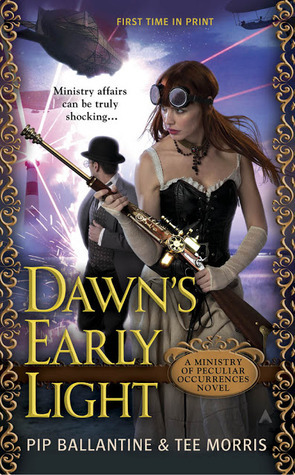 I am still reading The Ministry of Peculiar Occurrences series and I still love them. I am on book three now and as I said in my previous post, these are great books because of the story, not the individual lines. However, that doesn’t mean there are not some great individual lines. The ones for today’s post exemplify the characters personalities. And that is what makes these books so fun. The characters have great personalities. So without further ado . . . Quote-tastic Monday! Wellington Books was being entirely too obtuse, a trait Eliza attributed to his gender. I love them. Of course, Wellington and Eliza are falling in love. They just aren’t ready to admit it, even to themselves, yet. Yes, yes, I know. It’s not Monday. Let it go people. I’m on Christmas break. 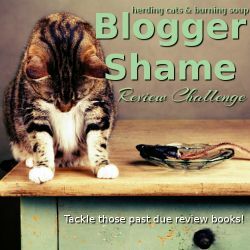 I have three other books that I should have already reviewed. I had every intention of reviewing them before I STARTED ANOTHER BOOK. So what happens? A new Innkeeper Chronicles title is released. All of my good intentions went the way of intentions everywhere at this time of year. In other words, I ignored them. Maud is in the beginning of a relationship with a vampire warrior. Did I mention the vampires are from another planet too? Anyway, they are having a difference of opinion and he has done something particularly stupid. My sister did that narrow thing with her eyes that used to make me run yelling for Mom . . .
Later, Maud and Dina are talking about Christmas presents and Dina wants to know what Maud is getting her. I love it! The only problem with this series is that there are only three books. This is definitely one that I could binge read. I highly recommend them. As you can tell, I think they are wonderful. 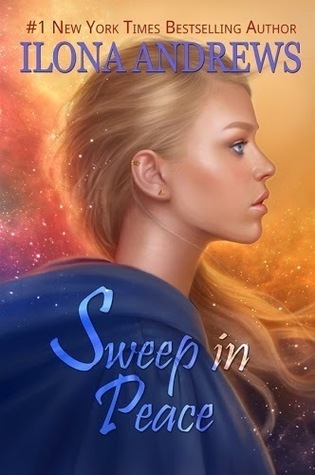 Sweep in Peace is the second book in a new-to-me series by Ilona Andrews. The title of the series is Innkeeper Chronicles and if that doesn’t sound very exciting, it’s because you don’t understand about Innkeepers. They are very powerful, at least while they are in their Inns. And yes, I capitalized that on purpose. The Inns are sentient or very close to it. I read the first two books in the series in less than 48 hours. Was I supposed to be getting other stuff done? Of course. Was I supposed to be reading another book? Of course. It didn’t matter. These books are just so good that I couldn’t resist them. I am a long time fan of Ilona Andrews’ Kate Daniels series and I think these may even be better. The only problem is that there are only two books published right now. 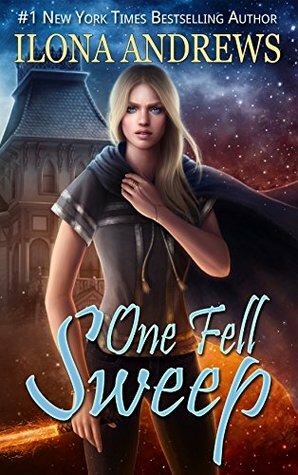 Book three, One Fell Sweep, is due out December 20th. It has been serialized on her website, but I would rather wait for the published book just in case there are differences. It’s hard to state with certainty about the genre of this series. They are definitely science fiction, but the science appears to be magic in our world. This is not a quote (simply because I am too lazy to look it up right now), but Dina does mention the fact that advanced technology on one world would appear to be magic on another. Anyway, a quote since this is supposed to be a Quotetastic Monday post. fear what we cannot see was the other. Need I mention that tea features rather prominently in these books? And there are a lot of things to fear that are just out of our sight?